Cornes de gazelle, the undisputed queen of Moroccan pastries is my first recipe for our trip to Morocco this month! No need to tell you how excited I am to begin our culinary journey through my homeland. Let me first introduce you to Bouchra, our new Moroccan cuisine expert, author of famous food blog “Ma fleur d’oranger” (in French). I invite you to get to know her by reading the interview she granted us. Who does not love Moroccan cuisine? It has a worldwide reputation and is an intrinsic part of the cultural heritage of the country. Indeed, Moroccan cuisine consistently ranks among the top ten global cuisines! But… There is the cuisine of Morocco and there is the cuisine of Fez! OK, OK, I was born in Fez and you will surely think I am chauvinistic! But that’s not the case! I have been cooking with love since the age of 14 and to this day, I still learn about Fassi cuisine every single day. My only claim is to teach and I would humbly say that whoever claims to teach shall never cease to learn. So for my first recipe, I chose a recipe that is originally from Fez. Fez is by far the Moroccan city that is the most rooted in history. With Damascus, Cordoba, Istanbul and Baghdad, it is one of the main cities of Muslim civilization. 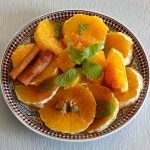 As the cultural, spiritual and artisanal capital of Morocco, Fez distinguishes itself by its great culinary diversity. The traces of its rich past are still present and Fassi cuisine features a variety of very different dishes. Recipes of some culinary Fassi specialties have long been jealously guarded by the women of the city, such as the khliee, a delicious beef jerky, which contributes to making the culinary art of Fez so unique. 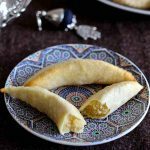 Making cornes de gazelle is definitely an art and it is precisely what Bouchra confirmed in her interview! Cornes de gazelle or كعب الغزال are part of Moroccan heritage and are popular around the world. In a nutshell, they are cookies that are prepared with almond paste! But store-bought almond powder (unless very fresh) is not recommended for this recipe because it would lose its authenticity, especially the taste and texture that will necessarily differ. Orange blossom water complements the delicious scent of almond. And some even add cinnamon. The success of this recipe lies in the dough that must be extremely thin and made from white flour. 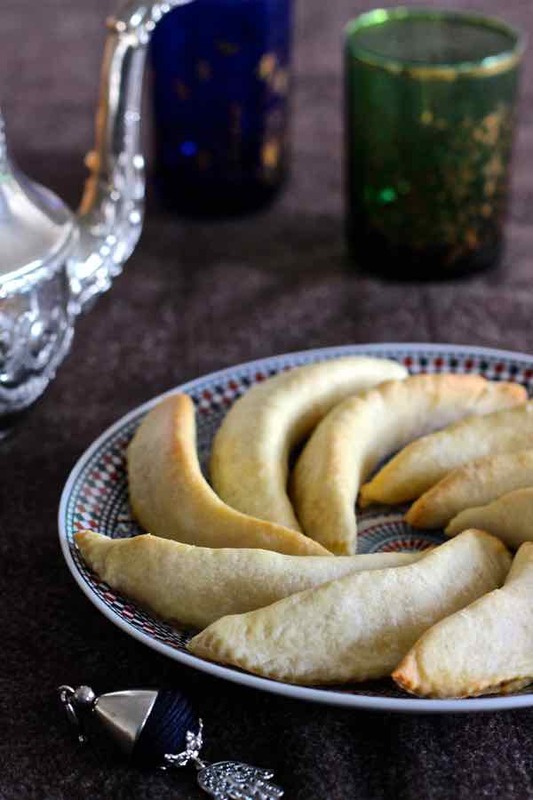 In Morocco, this pastry flour is called lforss or force. This dough that makes or breaks cornes de gazelle must be perfectly smooth and flexible enough to be rolled as thin as a sheet of paper and especially without any puncture. And it must strongly adhere to the almond paste. Another very important step: the resting stage. Indeed, cornes de gazelle should rest for 15 to 20 hours at room temperature before being baked and this is what will allow the dough to adhere very well and will avoid any puncture during cooking. And last key step: each corne de gazelle must be poked 3 times using a thin needle and absolutely not with a fork! Now this is how a traditional and authentic Moroccan corne de gazelle is made! This recipe was born in the kitchens of Fez. And know that if you ever visit Fez, beyond all the exceptionally beautiful sites and monuments of the city, tasting cornes de gazelle at the Medina of Fez is a stop that is highly recommended by all the guides. Generally speaking, cornes de gazelle are served during traditional ceremonies like weddings, circumcisions, engagements, large family meals but also during Eid and throughout the period of Ramadan. But where does this name come from? Ka’b (كعب) is Moroccan arabic for ankle and gazal (الغزال) means gazelle. But what does “gazelle” mean in Morocco? A beautiful woman! Yes, when a Moroccan meets a woman who is beautiful, he often calls her a “gazelle”! In the past and as recently as the last century, the majority of Moroccan women were dressed in a traditional manner with a djellaba that covered their face and body down to the ankles. Men could only guess their beautiful silhouettes wrapped in their traditional dress, and could only see their fine white ankles. Since this was the only part of their body that could be admired, young women took great care of their ankles that were always smooth, clean and white. Men called their ankles “cornes de gazelle” (gazelle horns). That’s where the name of these delicious cookies come from! Thus the essential condition for the preparation of this cake is that it should be slightly golden after cooking. If the cornes de gazelle are too golden brown, they will not be authentic as it would be considered an insult to beautiful Moroccan women whose ankles were clean, white and smooth! – Cornes de gazelle from Tetouan, a quaint little town by the sea, in the north of the country. They are nicely decorated with a tiny clip that is called mangach, which gives them a beautiful jagged effect. I actually found this unique little clip in a shop full of treasures that are imported straight from Morocco, a shop that I discovered with Mike during one of his trips to Paris a few months ago. I will definitely have fun with this great clip with serrated copper edges. 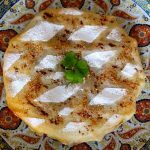 In Tetouan, sugar syrup is sometimes poured over cornes de gazelle immediately after they come out of the oven. – There is also the “quick version” of cornes de gazelle, aka the “lazy version”. 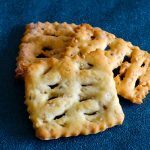 It is a simple version where marzipan is coated with sesame seeds or chopped roasted almonds. This version is known as the halwat hilal which means “moon cookies” as they have a crescent moon shape. – South Cornes de gazelle come from Ouarzazate, in the south of Morocco. Their stuffing is prepared with figs or dates, and sometimes a mixture of various nuts. 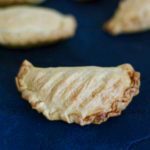 – Cornes de gazelle mssakar, also made with marzipan are generously coated with icing sugar immediately after they come out of the oven. Cornes de gazelle from my native country eventually travelled and today, you can find them outside of Morocco. 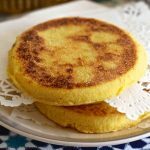 Tunisian cuisine calls them “cornes de gazelle Tataouine”, along with like many Tunisian recipes, a fried version called mahchi. 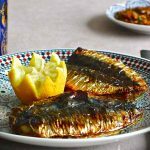 In Algeria, it is a specialty of the city of Algiers, called tcharak. There are different varieties of tcharak. The best known is tcharak msekkar which translates to “tcharak sprinkled with sugar”. It is a pastry made with white flour, butter and orange blossom water, filled with almond paste and generously coated with icing sugar. In Algerian Arabic, tcharek (تشاراك) means crescent. 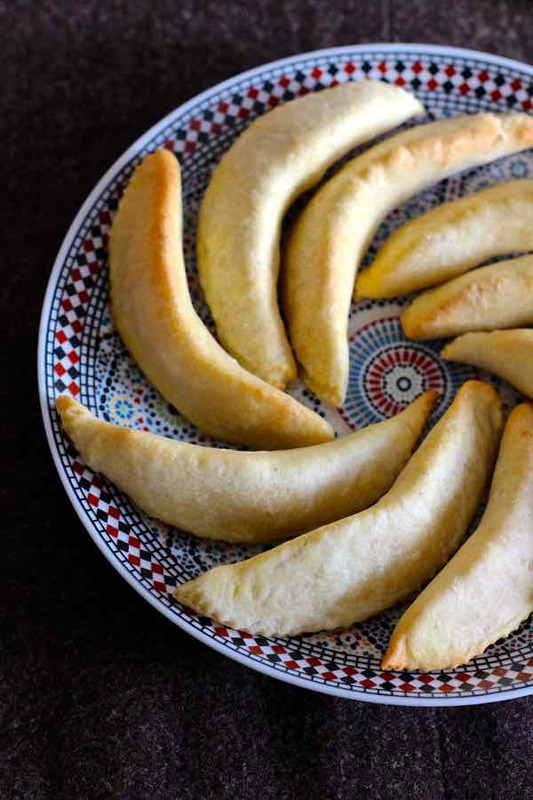 In some Gulf and Middle Eastern countries, there is a corne de gazelle version known as the “Palestinian crescent” or “Jewish corne de gazelle”. It’s a corne de gazelle whose pastry dough is stuffed with peanuts, with orange blossom and cinnamon flavors. As they come out of the oven, these cornes de gazelle are coated with crumbled wafers and/or sesame seeds, which gives makes them crispy. I prepared these cornes de gazelle during Mike’s last Paris visit. He was supposed to help me prepare this delicate and painstaking recipe. Geez… Patience is really a woman thing! Mike helped me a lot… especially to eat and take pictures of them! Yes, he is the author of these beautiful pictures! The reputation of these cookies is second to none. They have an unmatched flavor and texture, and they help me travel to my delightful childhood! 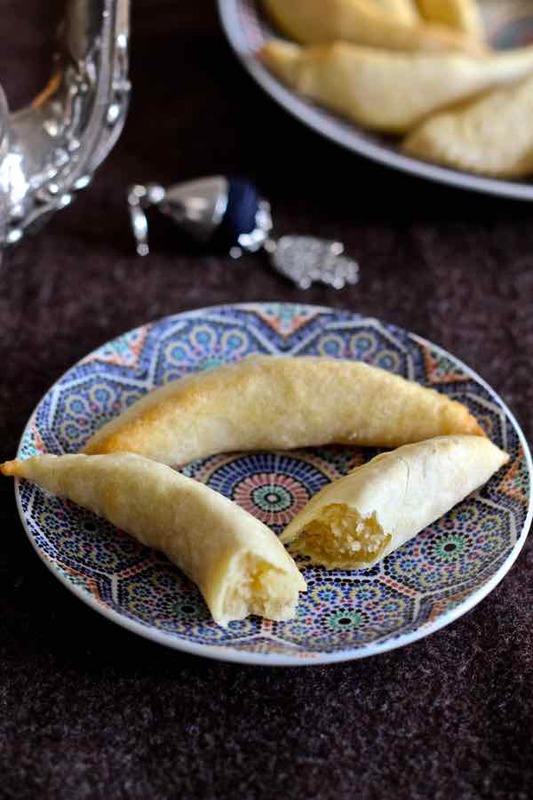 Cornes de gazelle are delicious traditional Moroccan pastries. 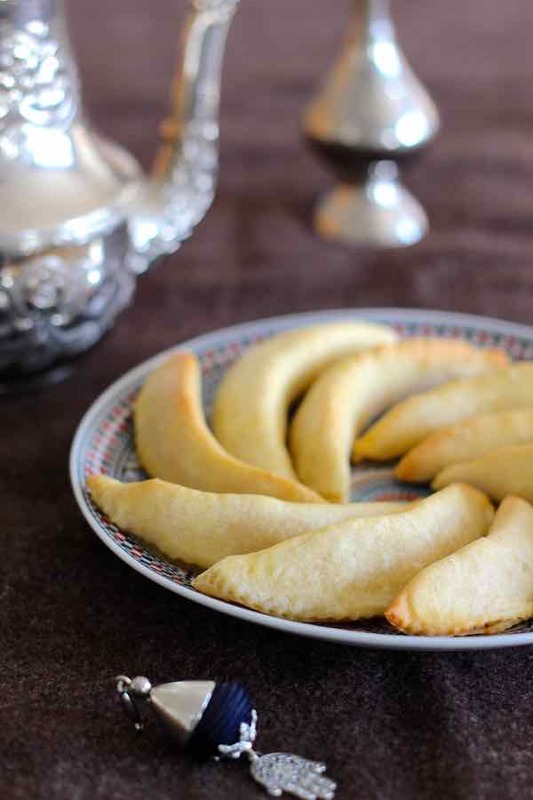 These crescent shaped cookies are made with marzipan and orange blossom water. In a large dish, pour the flour, salt, melted butter, oil, honey and egg. Mix all ingredients and slowly add enough water to make a smooth dough. Knead vigorously for 10 minutes until it becomes elastic and not sticky. Cover with a clean cloth and let stand while preparing the marzipan. Mix the blanched and peeled almonds with the sugar and grind them ideally with a meat grinder (or food processor if you don't have one) to make marzipan. Stir in the orange blossom water, butter and mastic. Knead the marzipan and make 2-inch long and 1-inch thick strands (about ¾ oz). Divide the dough into 6 small balls. Place a ball on an oiled work surface and, using a very smooth and oiled pastry roll (without imperfection), roll the dough thinly. Place a strand of marzipan in the center of the pastry dough and fold it. Shape the dough in the shape of a crescent by firmly pressing with your fingers to make the dough adhere to almond paste. Seal the edges by pressing strongly and cut the crescent with a serrated wheel leaving about a ⅛ inch edge. Repeat this process until you run out of dough and marzipan. Place the cornes de gazelle on a baking sheet lined with parchment paper and let them rest uncovered at room temperature for 15 hours, until they dry. Using a thin needle, poke each corne de gazelle 3 times on top, spacing the holes equally. Lightly brush oil on each corne de gazelle. Bake for 7 to 9 minutes until obtaining a light beige color, making sure that they do not turn brown. It is very important to closely monitor the baking so that the cornes de gazelle are very light. Let them cool completely on a wire rack before placing them in a sealed metal box to keep them in a cool place. What is the yield of this recipe? How many will it make? Hey Deborah, it will make about 50. It is indicated right next to the Ingredient header 😉 Enjoy!